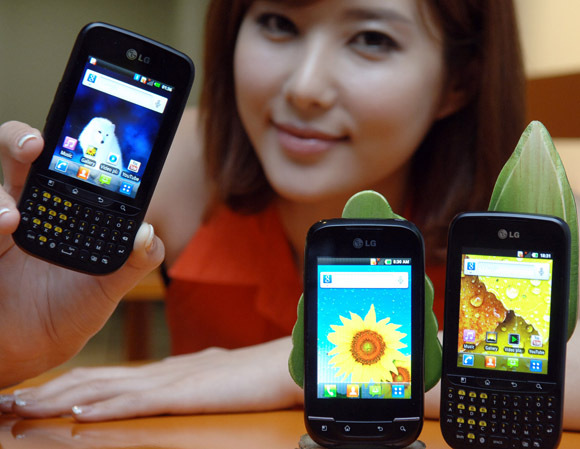 LG today announced expansion of its Optimus family of smartphones by introducing two new Andoroid 2.3 (Gingerbread) based smartphones – The touch and QWERTY device, LG Optimus Pro (LG-C660) and the touchscreen phone, LG Optimus Net (LG-P690). The first LG Optimus smartphone with a portrait bar QWERTY keyboard.The 2.8-inch display provides quick navigation while the QWERTY keyboard is ergonomically designed for fast and accurate typing. It has dedicated hotkeys for email and scheduler. Optimus Pro will be available in white, titan, as well as black. Optimus Pro boasts largest 1500mAh battery in its class and is packed with a 800 MHz CPU. Featuring LG Social+, the Optimus Net combines the most popular social networking portals in one convenient widget right on the homescreen. With a single click, users can multitask between updating their status on Facebook and Twitter while reading their friends’ social media feeds on the same screen. The integrated social widget provides one-click photo sharing with multiple social media accounts from the home screen. The phone comes with the LG SmartShare function allows easy sharing of content with other DLNA-friendly devices, 3.2 HVGA (320 x 480) display, 1500mAh batteryand a 800 MHz CPU. FYI, LG will ship Dual SIM models of this device in India, so It will be a dual SIM Android based device. Specifications for the Optimus Net will vary market by market. Depending on the carrier, some of the phones in Europe will be Near Field Communication (NFC) capable for mobile payments. The North American version will include a QWERTY keyboard and in Brazil, China, Asia and the CIS region, the Optimus Net will be dual SIM-compatible. The two smartphones will be available starting this summer, rolling out in 30 markets beginning in Europe. The phone will be available in white, as well as black.